Oh my—so easy and so delicious. It’s a country style dish— not quite the elegant dish that my previous oven poached salmon presents however in a different way, every bit as excellent and certainly a bit more economical. This time I bought a nice fresh flown-in salmon fillet for $6.99/lb. It weighed a little more than 1 lb. ; it was not super thick but just perfect for the making of this one dish meal. Spring time does bring some of the best foods around such as the fresh salmon from WA and Alaska; and then there is the fabulous fresh asparagus that appears. Lucky are we that there is a continual wonderful array of lemons, dill and fingerling potatoes that arrive in our markets for us to purchase. We are so spoiled; sometimes I really feel guilty being able to enjoy these feasts on a daily basis. I truly think about those in other parts of this world who are going hungry—no food for them—no glorious markets and displays for them. I think about that a lot however, that doesn’t stop me from writing these recipes for all of us to enjoy. So, here I am with another yummy recipe for you to cook for your family and friends—and maybe when enjoying your repast, you could send out a little prayer for those who aren’t fortunate enough to be able to enjoy a repast such as this. Sorry to have become maudlin but I do think that prayers are important. Enough Margot—-and on to the good stuff!!!! In a large Pyrex baking dish, place the cut potatoes with 2 Tbsp. olive oil and a bit of salt. Stir well and place in oven for about 10 minutes or until the potatoes begin to brown a bit. At this point, shake the dish and roast the potatoes for another 10 minutes.Take the dish out of the oven, push aside the potatoes to the side and place the asparagus mixture in the dish and mix it all; then place the salmon, skin side down, on top of all and brush some olive oil on top of the salmon.I I roasted my 1 lb. plus a bit salmon for about 20 minutes. (See below for further baking instructions for salmon.) 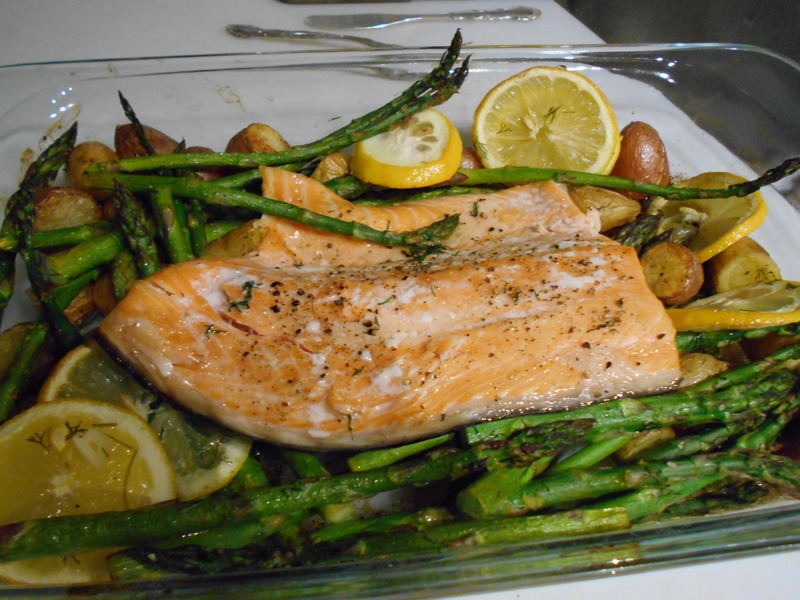 The salmon was divine, the asparagus not too done and the potatoes were perfect. I did serve the sour cream sauce (minus the mustard addition) with the dish. Also, before serving the salmon, if you wish, lift it off the skin with a metal spatula. All in all, it was a delicious and easy dish to serve. And best of all, the next day I had the Real Deal Caesar with the left over salmon, etc. A good rule of thumb is that the salmon will bake about ten minutes per one inch thickness of your fillet. A two-inch thick fillet will bake for 20 minutes. A 1-1/2 filet will take 15 minutes and so on. Check the salmon frequently. Start checking at about 10 minutes, and keep checking until the flesh of the fish is just barely an opaque pink. As previously mentioned, salmon baked in a closed packet – whether parchment, foil or a covered dish – is likely too cook a bit more quickly. Check it starting at about ten minutes and re-cover the fish before continuing. Remove the salmon from the oven as soon as the flesh becomes opaque. Serve immediately.